Since opening its first property in Seattle in 1999, the Ace Hotel Group has steadily claimed strongholds in nine other major cities. The latest to join the ranks is Chicago, where the hotel stands within a newly constructed building – a first for the group. Located in the historic Fulton Market district, a hotbed of watering holes and restaurants in the West Loop, the 159-room property was designed by local firm GREC Architects. Its glass-and-concrete aesthetics nod to the New Bauhaus, while the preserved brick façade of a former cheese factory, on the building’s southern wing, helps anchor the new build in the listed neighbourhood. 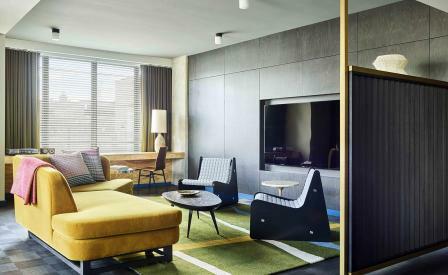 Once inside, the hotel’s fusion of past and present hits a sophisticated tone with interiors designed by Commune. Inspired by the city’s most famous architect, Ludwig Mies van der Rohe, his buildings at the Illinois Institute of Technology, and other key Bauhaus émigrés, the firm used simple materials such as polished steel, brass, plywood and linoleum as the grounding elements of the space. A large skylight system enables light to flood the public spaces, which are filled with bespoke and vintage furniture. Handwoven fabrics, leather and George Nakashima rugs add a craft-focused layer to the modernist interior, while upstairs, rooms come with pops of colour, lighting by Atelier de Troupe and furniture by Michael Boyd. Of course, it wouldn’t be an Ace Hotel without a range of carefully-curated creature comforts. In addition to the Midwestern fare served at its signature restaurant City Mouse, the rooftop bar Waydown doles out craft beer, cocktails and small plates. An outpost of Stumptown Coffee Roasters, the first in the Midwest, serves as a final flourish.